As long as I'm talking about my last visit to Seattle, I should mention that I made a momentous decision when I was there. I decided on what will be my regional headquarters for the Pacific Northwest once I conquer the world. I'm going to move in to the Pacific Medical Center on Beacon Hill. Currently occupied by a hospital and by Amazon.com, it's a big imposing ziggurat type castle that's visible from most of downtown Seattle. 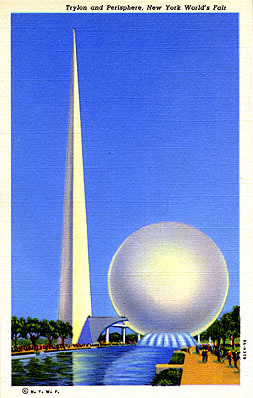 As for other headquarters buildings, I'll get somebody to rebuild the White City for me (obviously no room for it in Chicago, so I'll set it up out in Iowa somewhere), and I'll make my private retreat in the Trylon and Perisphere from the '39 Worlds' Fair, now located on a remote island. Bonus Material #1: While researching this blog entry, I discovered information on the 1937 International Arts Expo, located in Paris. The Nazis brought an appropriately bombastic design. The fair's planners had a sense of humor - they put the two pavilions right across the street from each other. Bonus Material #2: Doing a Google Image search for a particular style of architecture returns two hits on the first page for a building from Dubuque. Can you guess which style it is?